How would you describe your lab to visitors? The Connectivity Lab at the University of Michigan School of Information (UMSI) is focused on the question, “How do we solve problems when our A-list technologies are swept away?” Which is what happens during disasters. This lab provides a way for us to test our plans by running realistic problem scenarios and to practice solving those problems in constrained and unpredictable environments. The lab is part of the course Crisis Informatics, which I designed and teach. It reflects my real-world experiences. I recently retired as Global CIO from the International Red Cross and Red Crescent. I also co-founded NetHope, the organization helping to restore WiFi in Puerto Rico, and previously in refugee camps in Greece and other crisis locations. 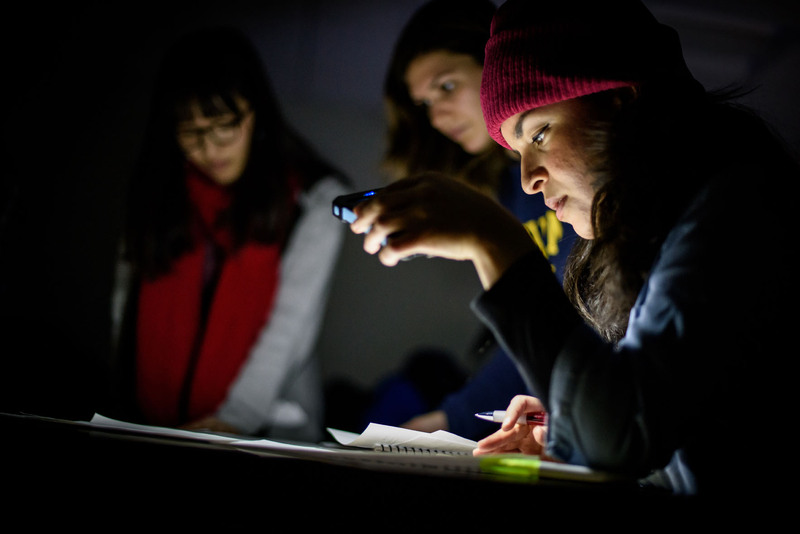 Students work under the light of battery-powered flashlights and cellphones. Cellphones may be used only with airplane mode turned on. What is a unique feature of your lab? We can control the voice and data communications in the room, and mirror disaster or emerging-country contexts. That’s important for understanding what the context-relevant technologies are. We spend a lot of time studying this and developing scenarios and simulations for practicing crisis response. We start with student teams but are seeking to provide a place where NGOs and corporations can practice crisis response in constrained environments and test how their plans and equipment work. Students were given a communications problem to solve within 60 minutes. Handheld radios were allowed. How many people are in the lab, and what is the mix of backgrounds and roles? The lab can hold up to 20 people for running a simulation. We run it with groups of 12 to 20 students, which is an ideal range for getting the right group dynamics for problem solving. In the end-of-semester lab, our master’s students develop a plan where roles and functions are defined. Of course, no plan survives a battle, so how to be agile and to improvise is part of the training. A student looks over a map with the locations of food and water supplies. Briefly describe a day in the life of your lab. We gather a group of 15 to 20 students and give them a scenario and a communications problem to solve. Then we kill the WiFi and cellphones, turn off the lights, and play the Omaha Beach scene from Saving Private Ryan—with the volume full blast. It’s very disorienting and chaotic for a student’s first time in a lab simulation. The students need to learn how to assess the disaster situation, come up with a plan of action, and communicate that to headquarters. We run the lab in sessions of 45 to 60 minutes each to work through the scenario and solve the communications problem. Sometimes it takes a non-technical solution, which requires some out-of-the-box thinking for the current generation. After a semester of study, we run the lab again, with some new injects (changes to the scenario that occur during the simulation). The students are able to navigate this because they’ve thought through A-plans and B-plans, and also learned how to improvise when encountering something unexpected. Students try to coordinate their response plan under challenging conditions. What is one feature of your lab that you could not do without? Definitely the hi-def sound and video system that create the immersion context. A student is administered first aid after becoming “injured” during the exercise. What is one feature of your lab that you want and do not have? We want to build the console we recently designed for storing simulation parameters and being able to call them up. Imagine “dialing up” rural South Sudan and solving a food-distribution problem to combat famine. We also want an expanded location where we can control the environment in the lab with more variables, like temperature and wind, as well as sounds, lighting, and electricity. The ideal location actually needs to be off campus somewhere in a sub-basement, so that we escape the university’s ubiquitous WiFi and all cell service. Sometimes our IT service can be too robust—that’s not what it’s like during disasters. We need the support of sponsors to make that happen. What is the one thing you see as the most important about the work you do there? The Connectivity Lab prepares people to navigate a crisis. That can range from personal to organizational, community, regional, and international crises. Being able to increase the roster of people who are ready to help is probably the best outcome of the lab, and why we do what we do. Companies tell us that their employees want to be engaged in humanitarian response in ways that leverage their skills. For technology companies, that means using their tech skills, and that often means applying telecommunication, networking, and software design knowledge. The Connectivity Lab is a place where we can come together around the same table and try things in a safe environment, where lives are not at stake. We know that communication and technology are increasingly a form of aid; experimenting in the lab rather than in a crisis is a way to innovate when the stakes are not so high. Scenes from Saving Private Ryan are projected at full volume to add to the sense of chaos.